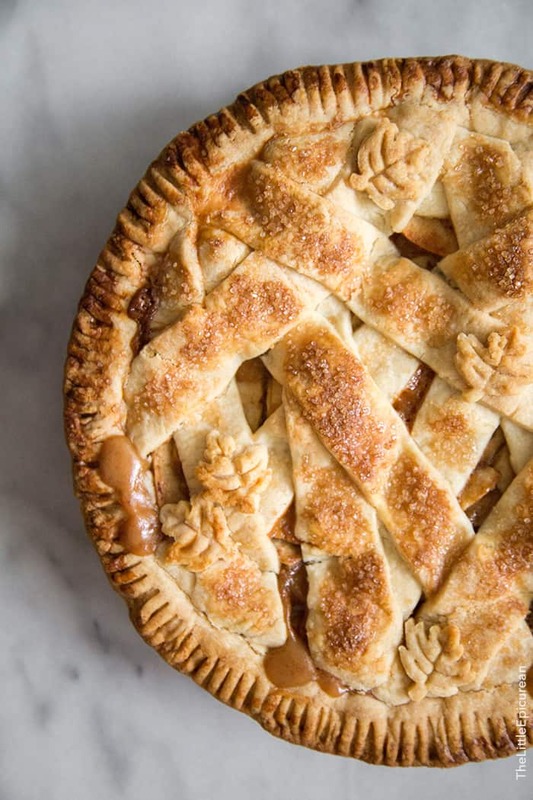 This salted caramel apple pie takes the components of a favorite autumn treat and turns it into a pie! AHHH! 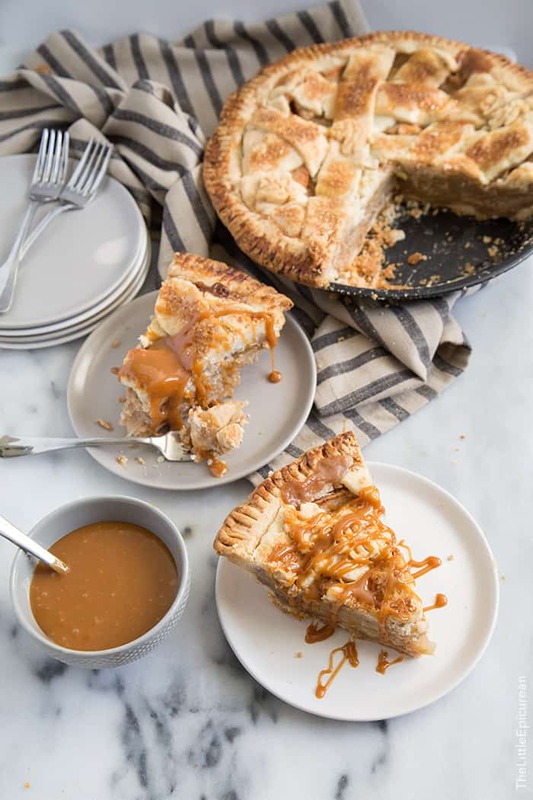 I’m trying on wedding dresses this week… and that’s not going to stop me from enjoy this salted caramel apple pie. I’m slightly nervous, but also ecstatic. An afternoon trying on dresses sounds like a good time to me. However, I’ve watched enough Say Yes to the Dress episodes (and other similar shows) to know that finding THE dress is not an easy task. That’s why at the end of the day, after sifting though who knows how many gowns, I need to come home to a slice of this apple pie. I love to eat apple pie, but I don’t make it very often. I have an extreme fear of peeling fruits and vegetables. I absolutely despise peelers. I’m left-handed and I have yet to find a peeler that feels comfortable in my hand. The fear of nicking off skin, or worse, slicing my finger open makes me panic. I’ve thought about getting one of those fancy apple peeling machines, but I’m also afraid of accidentally stabbing myself with the prong that holds the apple in place. As you can see, it’s quite the dilemma. It takes Alex a minute to peel 5 apples. It takes me about 3 songs to peel the same amount of apples. I’ve convinced myself that the time and effort makes the apple pie that much better when I finally get to eat a slice. I love, love, LOVE caramel apples. I’d pick a caramel apple over a candy apple any day. There’s something so perfect about a tart Granny Smith apple encased in rich buttery caramel. And when you translate that into a pie, it’s magical and delicious. Salt is amazing. It does wonders in cooking and baking. The difference in flavor between unsalted butter and salted butter is crazy. The addition of salt heights the flavors of everything. 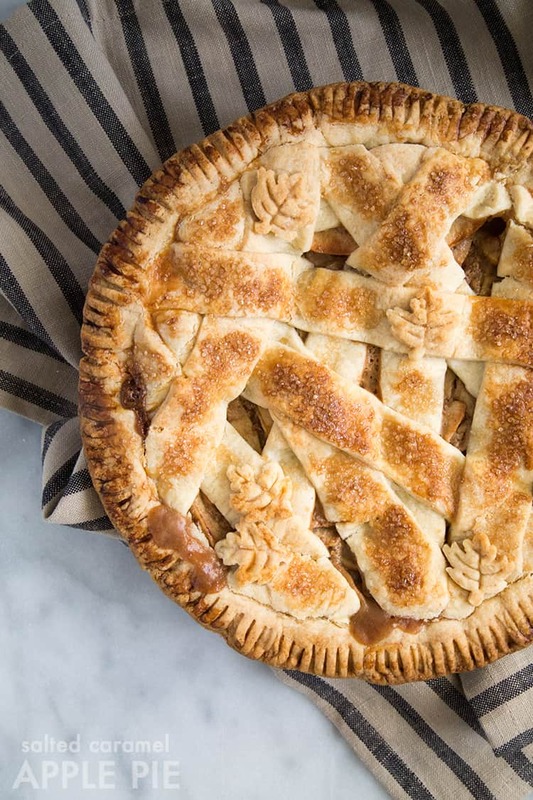 The salted caramel in this pie brings out the buttery notes of the crust. 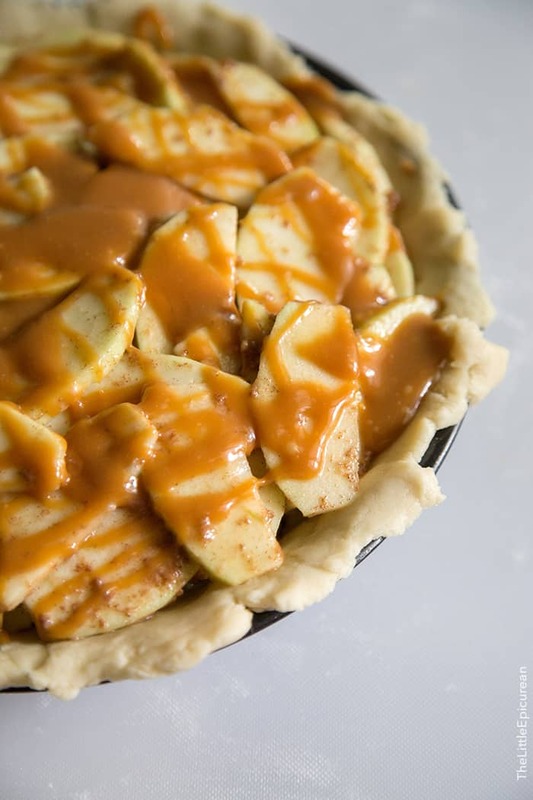 The sliced apples are placed into the pie dough in three layers, each layer drizzled with salted caramel. This provides the optimal caramel to apple ratio. 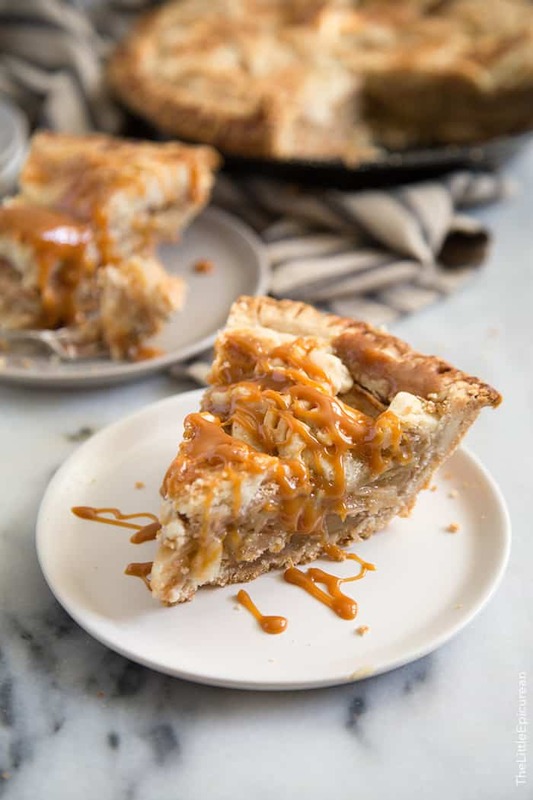 Each bite gets just enough tart apple, sweet and salty caramel, and flakey crust. And don’t worry, if you require more sweet- there’s plenty of caramel sauce to dress the finished apple pie with afterwards. In my opinion, there is no wrong way to top a pie. I had fun haphazardly creating this random lattice top. However, if you are partial to the traditional basket weave lattice top, have a look at the instructions from my triple berry pie. Ever heard the saying easy as pie? 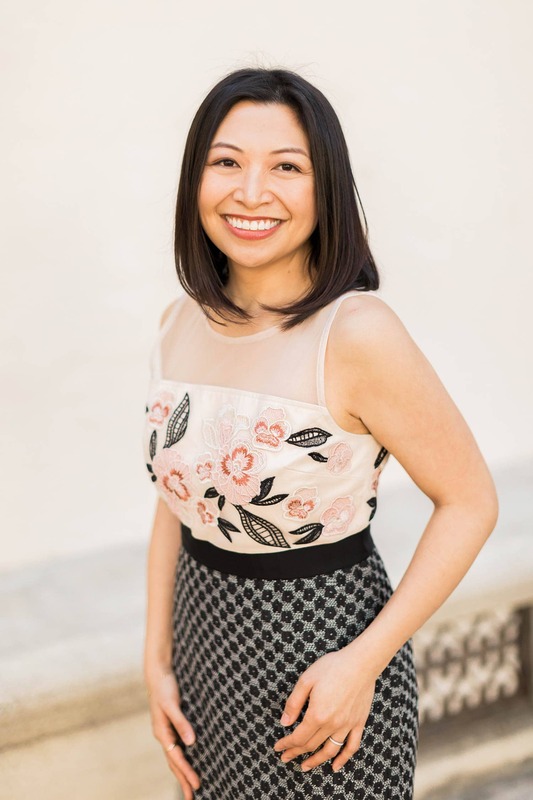 While I hardly think pie making is easy, I sure hope finding my wedding dress is easy as pie! In the bowl of a food processor, pulse together flour, salt and sugar. Add the shortening and butter and pulse until mixture resembles coarse sand. Add 4 tablespoons of water and pulse until dough has almost come together. If dough is dry, add another 1-2 tablespoons of water. Turn dough onto a clean working surface and push dough together into a cohesive mass. Divide dough into two pieces, one slightly larger than the other. Flatten the two pieces and wrap separately in plastic wrap. Chill in the fridge for at least 1 hour, up to 2 days. Remove dough from fridge and let stand at room temperature until pliable. Roll the large piece into a rectangle about 15 x 11-inches, about 1/4-inch thick. Using a knife or pastry wheel, cut the rectangle into strips about 3/4-inch wide. Place strips in the fridge to chill, about 15-30 minutes. Meanwhile, roll out the smaller dough on a lightly floured surface to about an 11-inch circle, about 1/4-inch thick. Place pie plate upside down over the rolled dough to ensure it is the right size. Transfer rolled dough to 9-inch pie plate. Firmly press dough into the bottom and sides of the pan. Trim excess dough, leaving a 1/2-inch overhang. Cover with plastic wrap and place in the fridge to chill for 15 minutes. In a heavy-bottomed sauce pot, combine caramels and heavy cream. Gently melt over medium heat. Stir until mixture is smooth. Add salt. Remove from heat and allow to slightly cool, about 2 minutes. Stir in vanilla. Carefully remove 6 tablespoons of melted caramel. Place in small bowl with flour. Stir to combine. Reserve this for pie assembly. Transfer the remaining caramel to a heat-proof container. This will be used to top finished pie. Preheat oven to 375 degrees F. Whisk together flour, sugar and cinnamon. Add sliced apples and toss to combine. Ensure apples are evenly coated with dry ingredients. Add 1/3 of apples to chilled pie bottom. Drizzle about 2 tablespoons of reserved caramel sauce over apples. Add another 1/3 of apples, followed with caramel. Add remaining apples and drizzle with remaining caramel. Arrange chilled dough strips over the apple filling. Use a fork to seal the edges of the pie. Lightly brush the top of the pie with milk. Sprinkle turbinado sugar on top. Place an aluminum foil tent over pie. Bake for 30 minutes. Remove foil and bake for another 25-30 minutes until the pie is golden brown and the caramel apple filling is bubbling. Serve warm or allow to cool to room temperature. Serve with remaining salted caramel. Caramel will thicken as it cool down. Microwave for 15 second intervals to gently loosen the caramel until it is a pourable consistency. Feigning for more apple pie treats? Be sure to check out: traditional apple pie, apple pie ice cream, apple pie moonshine cocktail, apple cinnamon pop tarts. Thank you! Day 1 of dress shopping wasn’t that stressful at all. It was really fun playing dress up! This pie is mouthwatering! Have fun dress shopping! 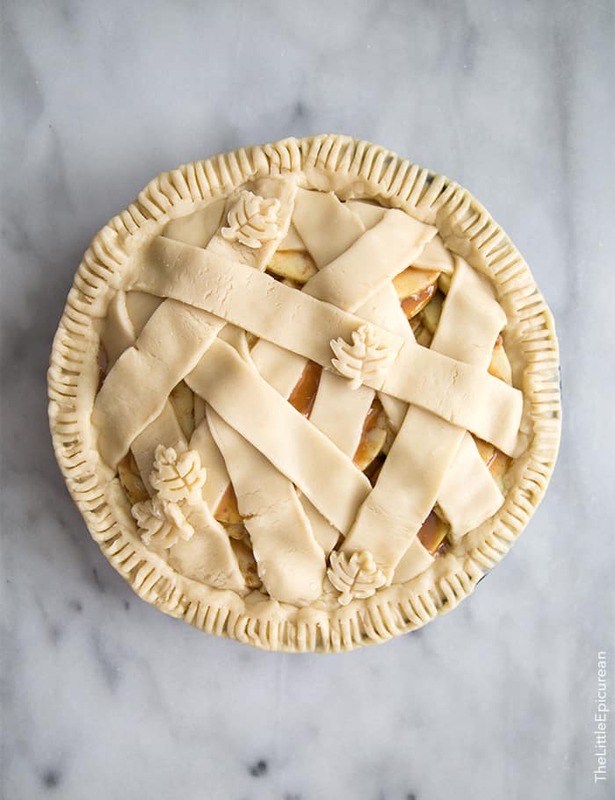 Ooooh, the PRETTIEST pie. As I see it, the person who peels apples most efficiently gets to take on the job of peeling them FOREVER. Right? You make the PIE, he peels the apples. Perfect plan. Thanks! I’ll have to try that peeler next! This sounds like such an amazing recipe for the fall! Can’t wait to try! Thanks Kristyn! Fall baking is my fav! Caramel apples are my thang. This pie has my name written all over it! Simply stunning! Gorgeous light, gorgeous pie. Gor-geous. This is SO beautiful, as always!!! I need this in my life! This is just BEAUTIFUL. Loving that caramel-y topping! Pinned!